Alexander Creswell returns to Watts Contemporary Gallery, exhibiting paintings from recent travels in the Holy Land. This new collection of small watercolours are on show for the first time. All artworks are for sale. Alexander Creswell travels the world in search of places of beauty and capturing the spirit of place in astonishing watercolour paintings. Light and dark are his muses and the patina of stone, brick and earth inform his palette. His work has been likened to JMW Turner and David Roberts but his fluency with light is quite his own. Works in this exhibition explore the rock-carved architecture of Petra and the ancient stones of Jerusalem, celebrating the play of changing sunlight upon stone. Alexander Creswell is an internationally celebrated artist known for his fluency and technical skill in watercolour. Creswell's paintings combine subtle colouring and skilful draughtsmanship with a deep reverence for natural light. 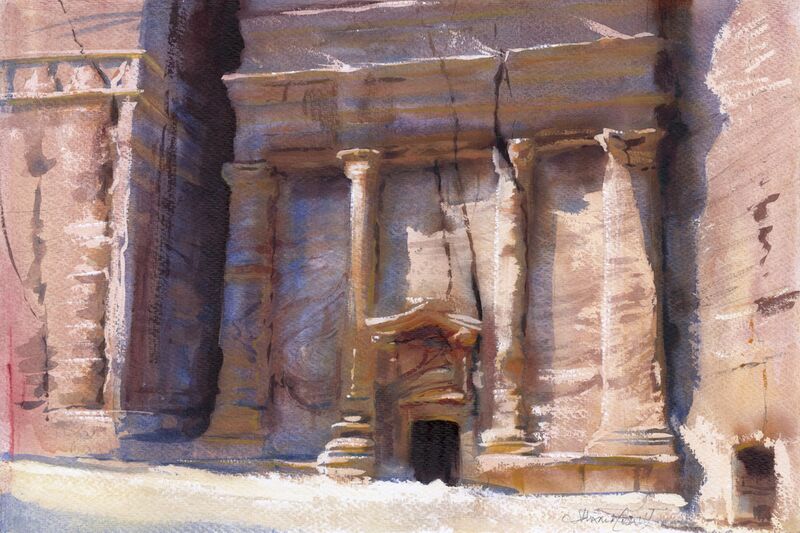 Join us in Watts Gallery on Wednesday 15 May, as Creswell provides an insight into his recent trips to Jerusalem and the Holy Land and the astonishing watercolour paintings he went on to produce - now on display and for sale in the exhibition.